Do any of you use a poultry egg candler and if so what do you think about it? I would like to buy one and wondered which is the best make/brand? I have already been recommended the Solway LED. Just wondered if there were any others that were good. I am thinking of getting a high intensity one as I have quail eggs. Hi Sara, I bought the Poultry magazine this month & there were loads for sale in there. It might be a good place to try if someone gives you some ideas on which are best! I've used candlers when the eggs are from 10 days plus they are really good, but the thick shells sometimes do not always shine through the egg, but definately worth getting one. i hold my eggs up to a bright sunny window or use a bright torch with a piece of card over with an agg shape cut out. Actually the easiest candler is a hole cut in thick paper/cardboard taped to a flashlight. The hole should be just smaller than the egg. Then just turn off the room lights (dark room) and on the flashlight. Then rotate the egg slowly and view what's cooking. 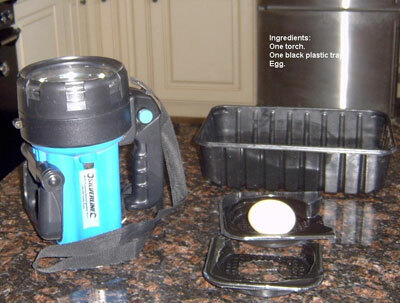 I use a Brinsea Candler and it is much better if you are trying to candle a number of eggs, very good value at around £15. Thank you so much for your advice and letting me know what you use. I'll let you know which I decide to get and I might even make one myself as well! 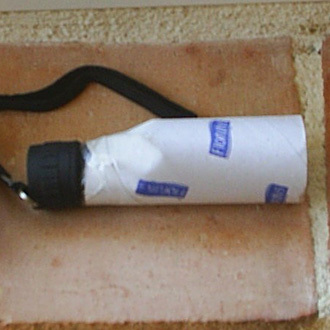 Sara, I made my candler form a toilet roll holder, cut a v at the bottom and sellotaped it round a maglite. Hi Mama, Im not quite sure what you mean. Where do you put the egg? on the V or in the toilet roll and does the torch go all the way in? Does the egg go all the way in? My hole in card and torch technique works ok but I'm intrigued. Thanks, my husband managed to work it out for me. I will try that. What I did last time was had a black plastic food tray with egg shape cut out and then sat this on a large torch in a darkened room. Could you both photograph your homemade candlers and I can add the photos to your explanations of how to make them and that might help others to make them! Sounds good making it yourself and saving some pennies! 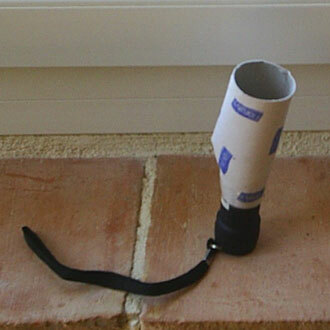 Yes please to the photos, I've saved myself a toilet roll holder, I'm poised ready to create my first egg candler! I have sent mine to Sara a few hours ago, so perhaps she hasnt got internet atm. Hi Sara Did you get mine and Mama's candling pictures? Yes I did get your pictures they are on my to do list! Just going to add them now. - In the words of Gordon Ramsey - home-made candler photos uploaded - done! Please see above. Thanks for sharing them with us, they both look great. I think Mama's looks the biz. i shall try that myself. Oh yes, getting Grace's foot better is what's most important and she's demonstrated she is a stayer for next time if the remaining two don't make it. My campbell comes off the nest 3 times a day for a dip in the bath and good feed. So thats when I will candle them in a week or so. Both of these candlers look great, think I might try both, but I like the idea of putting the black tray over the torch which gives you two hands free to turn it around. 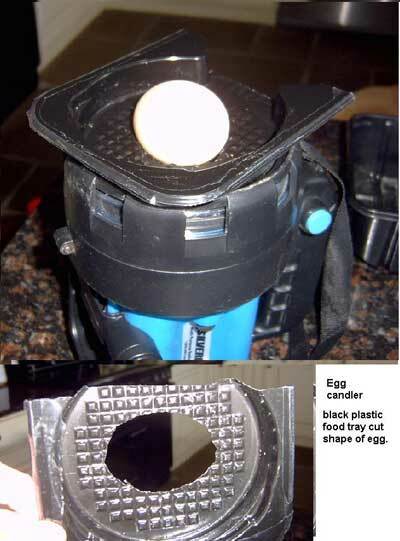 its only cos i have a huge bright torch, just dont make the hole too big so the light has to go into the egg. Is it ok to candle hen eggs at day 19? The eggs have started to pip so won't be candling the eggs!! !